There’s a certain mystique about wearing a leather strap watch that creates an air of distinction on the wrist. Perhaps, it’s the time-honored elegance a crocodile, alligator, ostrich, lizard or supple calfskin leather strap provides. Or maybe it’s the timeless traditional appeal… after all the very first men’s wristwatches introduced in the early 1900’s only featured leather straps. More than a century later, strap wristwatches are still widely popular and are prominently featured today in collections from such renowned watchmakers as Corum, Omega, TAG Heuer, Breitling, Cartier, Invicta, Graham, Greco, Lucien Piccard, Jaeger-LeCoultre, Eterna and IWC. In addition to their vintage appeal, strap watches are also more cost efficient to produce. 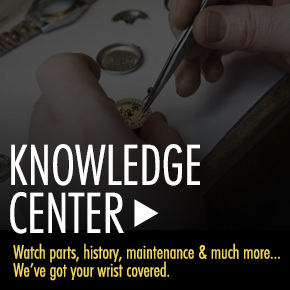 This especially holds true on luxury watches crafted in white or yellow gold and even titanium, since exotic-skin or leather bands are less expensive than models with matching titanium, white or yellow gold bracelets. 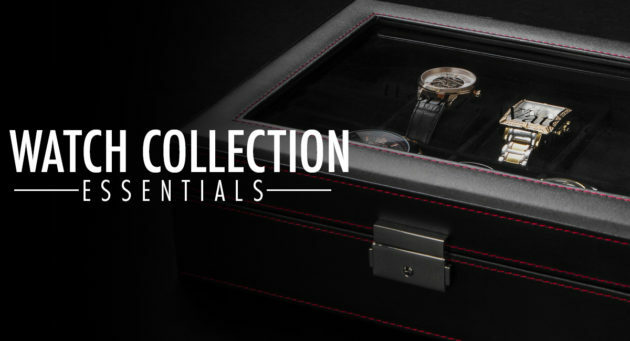 This week’s Watch Collections Essentials focuses on luxury high-end strap watches for men from some of today’s most sought-after watch brands: Breitling, Cartier, Corum and IWC. Cartier was instrumental in developing the very first men’s strap watch in 1904, when Louis Cartier created the Cartier Santos wristwatch for Alberto Santos-Dumont, a pilot who wished to wear his watch on his wrist, since pocket watches were too cumbersome to handle while up in the air. The Cartier Santos 100 Automatic men’s timepiece offers an updated, highly pronounced profile of the model Santos-Dumont wore 112 years ago. This amply proportioned, Swiss-made men’s watch features the signature contoured square-shaped case crafted to perfection in 18K yellow gold with alternating brushed and polished surfaces. The case is presented on a handsome brown alligator strap with a convenient deployment clasp buckle. The signature, polished 18K yellow gold bezel with decorative screw accents surrounds the silvery-white dial with luminous black outlined hands and Roman numeral hour makers. A blue cabochon-cut stone accents the polished 18K yellow gold crown. Features include a scratch resistant sapphire crystal above the dial and water-resistance to 100 meters or 330 feet. 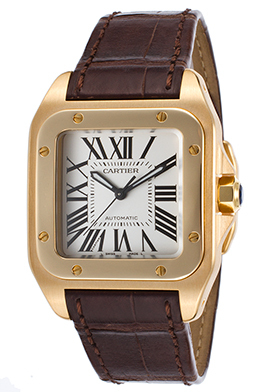 Cartier Santos 100 Automatic men’s watch is 33mm wide and 11mm thick. 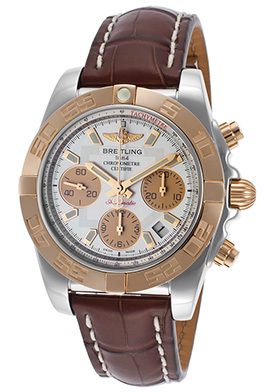 Breitling is another brand highly associated with aviator timepieces and the Breitling Chronomat 41 Automatic timepiece for men is an exceptional strap watch selection. The contoured round shaped case in premium grade stainless steel has a lustrous mirror-bright finish and is presented on the attractive brown alligator strap with contrasting white stitched detail. A deployment clasp closure on the strap provides added security and convenience. The lustrous 18K rose gold unidirectional bezel with engraved markers surrounds the silvery-white dial with three rose gold-colored sub-dials, luminous hand and hour markers. Features include an automatic date calendar, small-second, 30-minute and 12-hour registers. The 47-jewel automatic movement inside has a 70-hour power reserve. Additional features include a scratch resistant sapphire crystal above the dial, along with a locking screw-down crown and case back for water-resistance to 300 meters or 1,000 feet. The Breitling Chronomat 41 Automatic men’s chronograph is 41mm in diameter, 15mm thick and has been awarded official Chronometer certification from the esteemed COSC (Official Swiss Chronometer Test Institute). The Corum Admiral’s Cup Legend Automatic watch is another exemplary strap timepiece choice. This highly distinguished men’s watch features the unique 12-sided dodecagon shaped case in brushed, premium grade stainless steel presented on a striking black alligator strap with handsome stitched detail and a convenient deployment clasp closure. 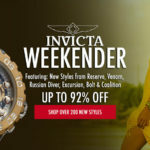 The stationary dodecagonal shaped stainless steel bezel surrounds the gunmetal colored dial with a date calendar outer dial surrounded by decorative nautical flag detail, a month sub-dial window, luminous hands and hour markers. An exhibition skeleton case back lets you see the intricate automatic movement inside. Features include a scratch resistant sapphire crystal above the dial and water-resistance to 30 meters or 100 feet. 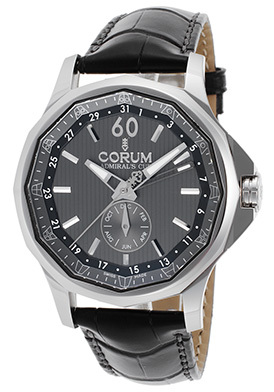 Corum Admiral’s Cup Legend Automatic men’s watch is 42mm in diameter and 12mm thick. Although rubber may not have the classic appeal and prestige of a fine alligator or leather watch band, it offers a more modern twist on time and is featured on many of today’s top-of-the-line timepieces. In addition, a high-end rubber strap can be as costly as an alligator or leather band. The IWC Portuguese Yacht Club Automatic chronograph for men offers an outstanding blend of premium grade stainless steel and high-performance black rubber. The amply proportioned case in premium grade stainless steel has a satiny brushed finish. The dynamic black rubber strap with textured detail on the center panel has a stainless steel deployment clasp closure. The silver-colored dial has two sub-dials, an automatic date window, silver-tone luminous hands and silver colored Arabic numeral hour markers. 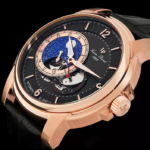 Features include a small-second register, along with a 12-hour sub-dial within a 60-minute sub-dial. An exhibition skeleton case back lets you view the Swiss-made automatic movement inside. Additional features include a scratch resistant sapphire crystal above the dial, 68-hour power reserve and water-resistance to 60 meters. 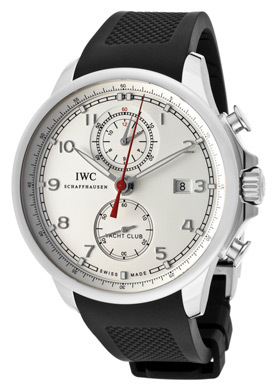 IWC Portuguese Yacht Club Automatic men’s chronograph is 44mm in diameter and 15mm thick.